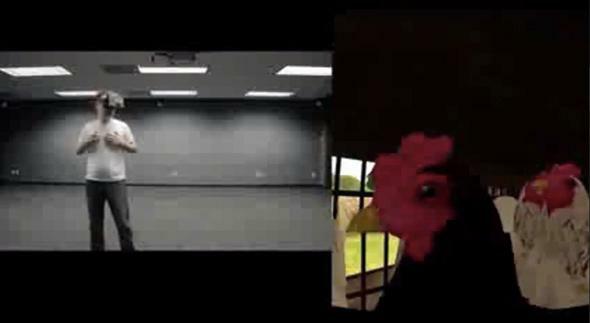 PETA's I, Chicken uses virtual reality to show what factory farmed chickens see before slaughter. Someone experiencing I, Chicken virtual reality gets put in a cage with other chickens to be transported to the slaughterhouse. The animal rights activism group PETA knows how to use shock value to get people talking. And there’s nothing more shocking than immersing someone in a visceral experience that reveals dark truths. So PETA’s youth division peta2 is putting University of California–Berkeley students into a virtual reality where they are a chicken and go to be slaughtered. Eventually, though, the chickens come home to roost, or perhaps a better cliché here would be the other shoe is bound to drop. Because the chickens don’t go home. You and your chicken friends are rounded up by the farmer, put in a cage, and brought to the slaughterhouse. PETA hasn’t worked with VR tech before, though as Motherboard points out the group did create a digital frog dissection simulation a few years ago. But chickens and VR seem to go together: In May, we learned about Second Livestock, a project out of Iowa State University that proposed putting factory-farmed chickens in a virtual reality world to make their lives seem better. That project was meant to stimulate discussion about how society uses tech to solve problems, and PETA’s I, Chicken is using VR to try to spread empathy for factory farmed animals. It’s a neat example of a technology being implemented on both sides of a problem, but probably all the chickens want is to get as far away from all this tech and human meddling as possible so they can peck and socialize in peace.